There is still time to enter the CSN $80.00 giveaway Here. Entries will be accepted until midnight 8/23/10. Good Luck to everyone! I promised to show you my new Restoration Hardware look-a-like table that I purchased for $379.00 compared to RH price for the same table of $1295. You can read about my obsession to find a similar table at a reasonable price Here. It’s funny how one little table can create so many changes! Of course we had to pay to have Sheetrock repaired, new paint color was selected and the wall painted, a wall unit had to be sold to make room and a new lamp, mirror and accessories were purchased. I have the best husband in the world to go along with my crazy ideas and constant changes. New $10.00 lamp reminds me of antique wine bottles. I love the new mirror from Anthropologie…especially at 70% off! in-take vent. We noticed this summer that the family room was not cooling as well as the rest of the house and that the air conditioner ran constantly downstairs. This resulted in some very high electric bills. I really don’t like that you can see the vent but we noticed immediately a dramatic difference in the temperature of this room and I know it will pay off in our electric bill. I have a busy day tomorrow working on a project I have been putting off for two years. Thanks for dropping by and all your kind comments. love the vignette and the new lamp. the table is beautiful with those planks and column style legs. have you considered spray painting the vent the same color as the wall? that would make it somewhat "disappear". Sherry, Sherry, Sherry, can I come live with you and just gaze at that wonderful table and vignette you have created? OMG I LOVE all of it. Looks like a magazine spread. That lamp was ten dollars oh my. You have all the things I love on that table and above it. I love those mirrors. If you want to make the vent less noticeable paint it the same color as the wall and it will blend right in. I have painted most of ours and need to do the one in my bedroom too. Now I want one of those tables. This looks wonderful! 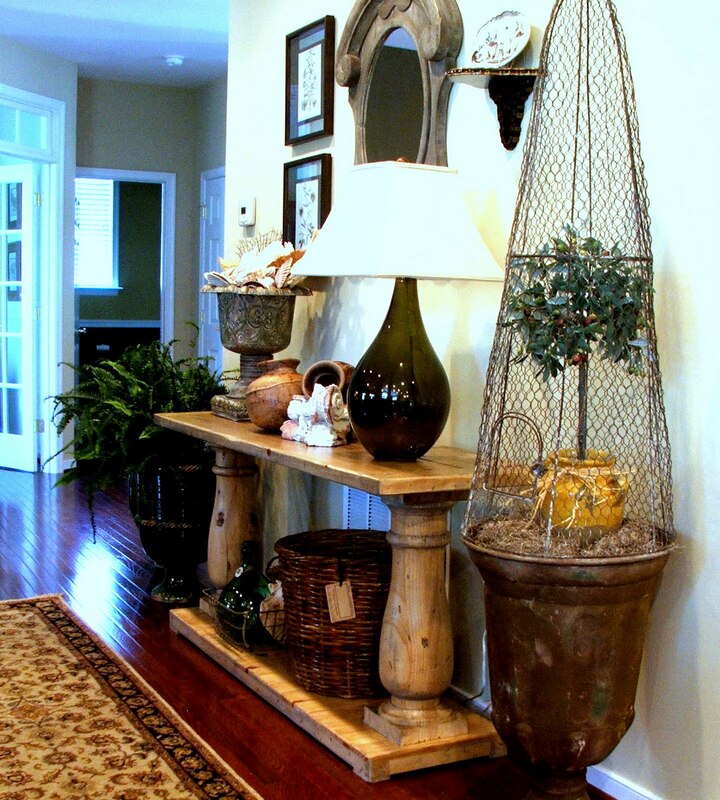 I love the combination of items you collected for the wire basket, urn and tabletop. Your new table is gorgeous! Lot's of great eye candy here! Beautiful entrance table and vignette! What a gorgeous vignette! I love every single element you used! The table is stunning…a beautiful replica of the Restoration Hardware table! The mirror from Anthro is to die for…I would have moved heaven and earth to get all of those gorgeous goodies into that spot! I love this look! So very French Country!! I just checked Anthropologie.com and didn't see that mirror listed. I love it! They must be all sold out. I have just gotta know…where did you find that beautiful $10 lamp? I also LOVE that neat looking mirror…get deal at 75% off!!! Oh my Sherry!! This is absolutely beautiful! What a steal to find that gorgeous table and the end result is so lovely. You must be thrilled every time you see it. I second the idea of painting out the vent the color of the wall. It will be so less noticeable to you. Of course, a large fern-like plant in front of it will still allow air to flow but block it just as well. Your table is an amazing look alike…I think you just wanted it so much that it found you! The entire vignette looks great and I agree with the others' suggestions to paint the grill out in the wall color. After doing this, you might also want to consider further obscuring it with a slavaged piece of wrought iron work, possibly faux painting it with several shades of grey, taupe, cream so it adds another layer of interest without calling huge attention to itself. If you like this idea, I can email you a photo of gate finished in these colors so you could take a close look for replicatig the patina. Enjoy your fabulous new table and this absolutely wonderful new space you have created! Oh my! You are absolutely beyond talented! I just love it and especially love that you didn't give up on the look you wanted but just found it for less! The best kind of decorating in my book! The entire vignette looks fantastic, Sherry! You did a beautiful job grouping these things and displaying them. The mirror, the lamp, the accessories, that table…Love it all. Oh, and I LOVE the giant cloche/topiary form. I saw some online (not sure they are that big) and I want a pair so badly! This just looks fantastic! I just love your style! The table is perfect and so are your vingettes. I am in love with the big urn full of seashells….be still my heart! The Anthro mirror is perfect and so is the lamp. What a beautiful job of creating such a welcoming entrance. I just love the look of everything!!! What a fun table! I love it all, functional and pretty-enjoy! HI Sherry! Oh, this looks fabulous!! I love your table and that lamp! Everything is so pretty! Love it all, that table is just beautiful! Very unique lamp. Perfect!!! Thanks for sharing. Oh, I love everything! Your table was well worth all of the changes it caused. You had me at Restoration Hardware and you did not disappoint. Everything you do is ALWAYS amazing!!! I have a special surprise for you!! I am posting to my blog right now! eek! I am thrilled it is for you! Sherry, this looks terrific. Love that new mirror. It has fabulous character. 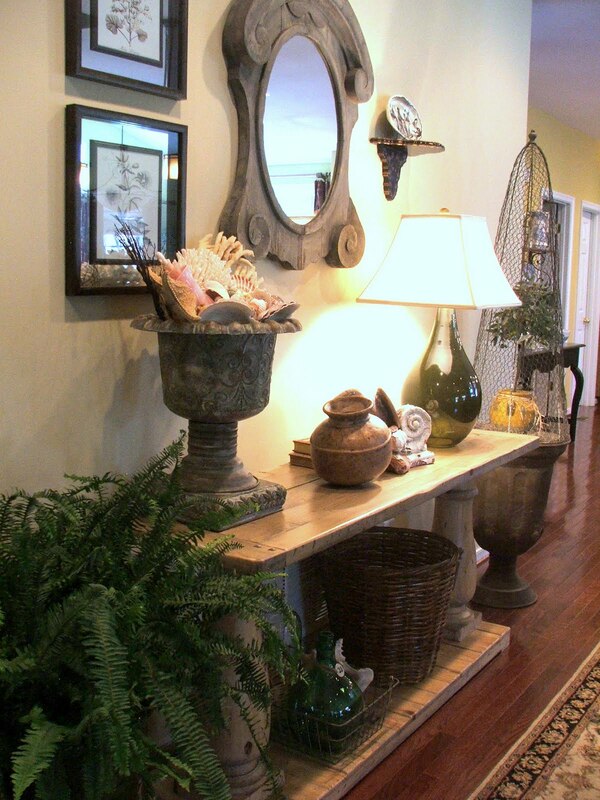 Your vignettes are charming with that huge urn full of shells. Everything plays off of each other to make a stunning wall. Ohhh my goodness!!! What a fabulous table…and what a gorgeous vignette that you created for it! My friend, this looks just like it stepped off of an interior design magazine page! It really is perfect…you must be very pleased with this transformation!!! I love the large urn with the shells and ohhh, that humongous wire cloche is "to die for"!!! Wherever did you find that! It's fabulous!!! Well my friend, thank you so much for sharing your new table and fabulous vignette with us…this has been such a treat!!! I also wanted to thank you for coming by and taking a peek at my Summer's Tea on the Veranda! I really enjoyed your visit and sweet note! Thank you, my friend!!! Wow Sherry, this is FABULOUS!!! Love the style, and what a bargain, I'm crazy about that Anthro mirror too. Honey, you did GOOD!! I loved your comment on my blog. Thank you!!! You are SO right…the table needs to find me at this point. I've done all a person can do. Sounds like you had a similar story with your console, and look at this beauty! And the PRICE! I'm especially loving the mirror at 70% off! You are one blessed woman! Happy for you! Absolutely gorgeous! I am bookmarking this post and am going to refer to it when I am doing my next hall table re-do-I love this!!! Where in the world did you get that lamp? It's fantastic. Of course the table is great but that lamp is perfect on it. This all looks so beautiful! The table is amazing. I'm loving that mirror. I wonder if it's online. I am going to go check! Sherry, I absolutely LOVE that table! WHAT A DEAL! 🙂 I might have to order one myself!! Thanks so much for linking up this Friday, I'm SO glad you did, and I value your participation! Hope you'll link up next week too! Oh my goodness, I love that table! The legs! I love that mirror! The curves! And the lamps! I love it all! I love Restoration hardware, just not their prices. You did a great job here! What awesome inspiration, showing us all a beautiful look for half the cost. Absolutely gorgeous!! I love it all! It looks fantastic. I really like the chicken wire topiary!! What a beautiful style you have! Hi Sherry — great table! But what about your mirror? Is that the RH one? I've had my eye on it and it looks spectacular in your room. BTW – we have a unique kitchen backsplash giveaway that might be useful to you or a friend. I see your giveaway is past but lease stop by our new Giveaway Friday! party and link up next time. Jane F.
Your table is gorgeous, the entire area really. Glad I found your blog today, am now following. I wanted to let you know about Atticmag's new linky party – Giveaway Friday! It's a convenient place for bloggers to link their giveaways each week. We've kicked it off with a fantastic giveaway of our own. Five lucky winners will win material to do a backsplash in their homes. Hope to see you there! I love this table too! What an amazing find for that price! It looks beautiful and goes perfectly with all your lovely things.